Has anyone seen that big moon up in the sky lately? It has just been gorgeous. I look for it every night. 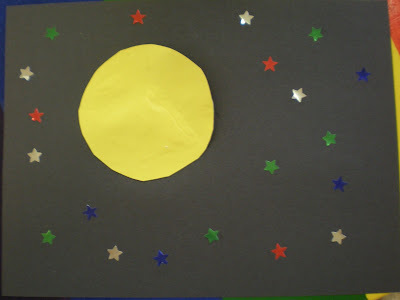 I found a neat craft to make that gives you two different phases of the moon. 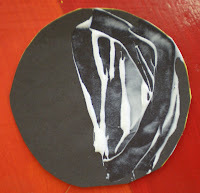 The first step is to cut out two circles from a piece of black and a piece of yellow paper. I made my circles about 3-4 inches in diameter. If you have older children you can draw the circles and let them cut them out, or you can give them something to trace to make the circles and then let them cut them out. 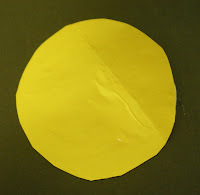 After you have the circles, glue the yellow and the black one together. Put glue on the black side of the circle, only covering about 3/4 of the circle. 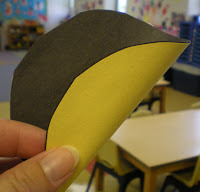 Glue this to a full piece of black construction paper. 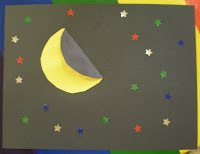 I had some foil star stickers that I added to make it look like a night scene. You can always use cutout stars too. 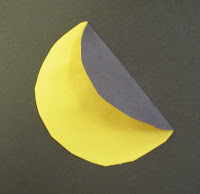 The final step is to carefully fold over the part of the moon that isn't glued to the paper. Press on the crease very well. Now you have a crescent moon. Open it up and you have a full moon. TA-DA. What fun! It looks easy but the effort is intense and it will be a great way to play a creative game of art with kids. Thanks so much for posting this idea! That's really cool! And it does sound very easy. We might have to try it. Perfect idea! I think we'll use this with our creation unit. Thank you! we'll be doing this project today!